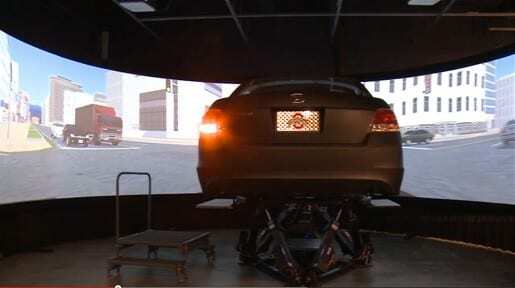 The Ohio State University Driving Simulation Laboratory offers a state-of-the-art facility for measuring driver behavior. The facility provides tools for evaluating in-vehicle systems for infotainment and vehicle guidance to ensure conformance with National Highway Traffic Safety Administration (NHTSA) driver distraction guidelines. They also investigate attention, stress, cognitive workload and other factors in the driving task; and measure driver preference for braking, steering, and other vehicle handling characteristics. The lab works with a variety of partners from the automotive industry, as well as with researchers at Ohio State, other universities and the Ohio Supercomputer Center. Come and learn more about this amazing facility, and then join Sigma Xi researchers from a variety of disciplines at Meister’s (1168 Chambers Rd, Columbus, OH 43212) for further discussion. Posted by Rowan McLachlan (Communications Committee) at 4:15pm Posted in Uncategorized. Bookmark the permalink.